When Konrad Curze arrived on Nostramo he, unlike the majority of his brother Primarchs, was not adopted by a mortal family and raised learning about his world and eventually rising through the ranks to power and prowess through nobility and strength of arms. Instead Curze found himself in a world in the grip of evil. Nobility was as rare as freedom and any strength of arms was displayed by the ruling classes lashing out at the weak and vulnerable. Curze, as a child saw the very worst of humanity as the ruling classes gorged themselves and crime ran rife through the lower classes as the desperate became the dangerous. Curze responded to the base instincts hardwired into his being and began to deliver his own brand of justice upon those that would deliver fear and misery that had Nostramo in a stranglehold.With nothing more to guide his actions than the very violence he sought to stop and his natural ability for stealth – coupled with the physical prowess as a Primarch – Curze took a bloody toll. It’s well documented that Curze took control of the planet following a long and bloody campaign of terror on the wrong doers. By the time the Emperor arrived to whisk away the progenitor of the 8th Legion much of the damage to Curze’s psyche had been done but the extent of it was yet to be determined. The simple truth is that Konrad Curze was telepathic. Profoundly so. But so much so that he could slip deeper into a man’s soul then one should ever venture. And each time he took with him a sliver of whatever he found there. As a result he understood the Emperor’s true purpose for his sons, knew of Horus’ darker side and Angron’s path to damnation. His strained relationship with his father and brothers and his disgust with the people of Nostramo was entirely down to this pervasive gift, although he went to extraordinary lengths to hide it. His ability to seek out evil on his adopted home world can only be the result of hearing the thoughts of his prey. Equally, his resentment towards the Emperor is because he, more than any of his brothers, understood the true relationship the Emperor intended for his sons. There were warriors and leaders of men first his children a very distant second. And for one forced to look inside the dark souls of bad men and who had endured much he arguably needed his father’s support more than anyone but, like all his brothers, was pressed into service as part of the Great Crusade. I suspect the Emperor knew of Curze’s power but not the extent of it. Perhaps the overwhelming emotions surging through Nostramo enhanced Curze’s abilities or developed them as a child far sooner than would have been planned. However, Curze’s brooding nature kept the Emperor at arms lengths and he never knew just how troubled his son really was. All this made him incredibly isolated and paranoid, fearful that his secret would be discovered; more so after the Edict of Nikea. As a result he began to pass on self-sufficiency and the lessons in fear to his sons, all the while trying to hold back the thoughts of others and the darkest side of his own psyche that pushed harder and harder to be given voice. Eventually Curze would lose that battle of wills, the evils and excesses of those worlds the 8th Legion came into contact with driving him ever down a dark path. Curze’s understanding of the human psyche drove him and his legions to embark on wars of terror on worlds. Curze’s abilities I suspect allowed him to hone his terror tactics to a cruel art form. However, for one such as psychically sensitive as Curze, for each debase act and bloody campaign of torture and mutilation it left an open,sucking, wound on his soul and in so doing drove him to become the very thing he went to war to stop. And with his home world once again in the grip of murderers and other scum his legion quickly filled with the very types of psyche that were slowly driving Curze insane. The destruction of Nostramo by the Night Lord fleet was as much to cull the evil radiating of it in waves as anything else but the psychic bow wave would have torn Curze’s mind to shreds, the waves of pain, evil, hatred and fear mingling with his own sense of self loathing and tipping him over the edge. Soon his terror campaigns were as much about venting his own rage and pain as it was terrifying his opponents. In the end Curze welcomed death at the hands of an assassin because he realised that, for all his father’s scheming, he understood the necessity for the deceit surrounding Gods and daemons and was designed to protect Imperial citizens. Although his bitterness was such that he still swore vengeance upon his father and the Imperium as a whole. 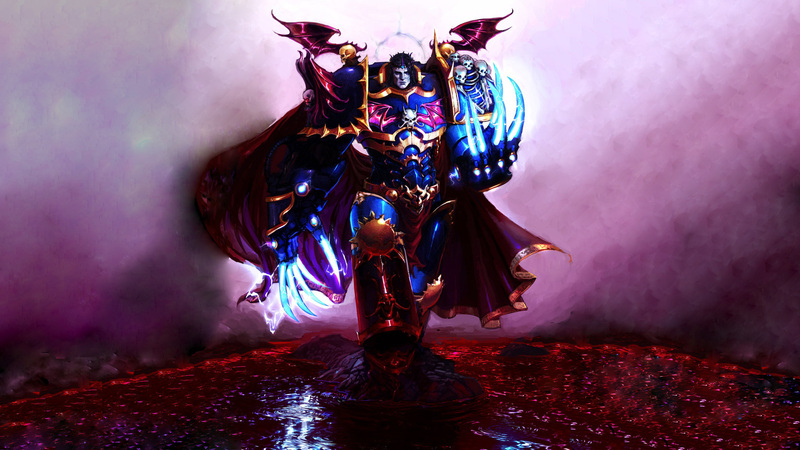 In the end the Emperor was never able to use Curze and his legion for what he’d always intended and Curze was too damaged by his early experience for his fate to be anything other than a grim one. And he knew it too.